John Perry Barlow, founding member of the Electronic Frontier Foundation and Freedom of the Press Foundation, died on February 7th, 2018. To say that he left his mark on the Internet, and by extension modern culture, is something of an understatement. He may not be a household name, but between this activism (online and off), lectures, written work, and various entrepreneurial projects, his 70 years of life were surely not wasted. Barlow was once quoted as saying “I want to be a good ancestor”, and by pretty much any metric it would seem he made good on that goal. To mark his passing, [Moritz Metz] came up with a rather unusual memorial. 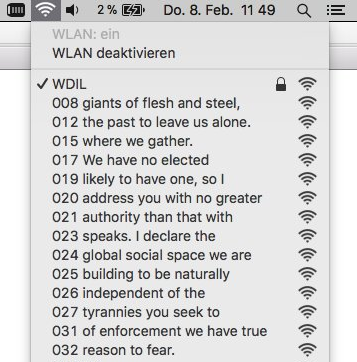 Using a bit of code on an ESP8266 board, he created a device that would broadcast out Barlow’s “A Declaration of the Independence of Cyberspace” line-by-line in the form of 228 WiFi SSIDs. Perhaps not the most effective way to get Barlow’s words out to the people, but we’ll give him extra points for style. The code itself is based on FakeBeaconESP8266, which as the name implies, allows the user to create fake WiFi networks. to broadcast the manifesto of your choosing, you need only add in the appropriate sendBeacon() lines at the bottom of the code. It would appear that prefixing each line with a number is required to make devices scanning for networks show the lines of text in proper sequence. At least on the devices demoed, anyway. Just to be clear: you should definitely not do this. Jamming up the local environment with a bunch of fake networks is a pretty terrible idea. But as a memorial for a man who occasionally claimed to be an anarchist, you could do worse. Plus we have to admit “Giants of Flesh and Steel” is an awesome name for a network. Sure beats carving one’s name into the moon. BLASPHEMY. Sure this guy was a pioneer on the net, but before all of that he was one of the lyricists for THE GRATEFUL DEAD! To neglect that major detail……. More accurately Barlow was a pioneer in the freedom of those using computer networks long before internet availability was wide spread With the US population. I sure I still have the issue o Board watch magazine that announce the creation of the EFF. I could have let this slide, but you where characterizing the article an inaccurate, when calling for the inclusion something that isn’t accurate. I can’t discover how Barlow was pioneer in regards to the creation of the actual internet. nuthin’ left to do but file, file, file. I like it. I’m gonna tell the neighbors just exactly what someone anonymous thinks of them! Unless I conclude they might know how to triangulate. Crazy! 10 years ago with an ESP8266? You are a god. You’re write up ooks much better than HaD’s by leagues as well… Much informative. I have found that a black ice campaign during the winter helps. The good news is that chances are good that Hackaday and other related sites probably aren’t read by enough to help this become a wide spread practice. I’d have to chance my broadcast to STFU if does. Is it really a jammer as such? I’m under the impression it still does the CSMA/CA a normal Wifi node does. No, see the article that was linked to about jammers. Rickrolling people with SSIDs sounds better. I know, that’s the first program I flashed into ESP8266 when i bought it. I think I’ve found it on Hackaday if I remember correctly. From that example picture it seems the guy wasn’t a poet or great speech writer. But that’s not the problem, the problem is that apparently people didn’t tell him. The Cory Doctorow of his time. Notice how there are missing numbers? Yeah, the picture doesn’t show everything. Incidentally, he was, in fact, a poet. He wrote quite a few songs, mainly for the Grateful Dead. That way they can easily track what sites your visitors go to by monitoring the certificate verification system. Always knew there was a reason Google pushes it so much.